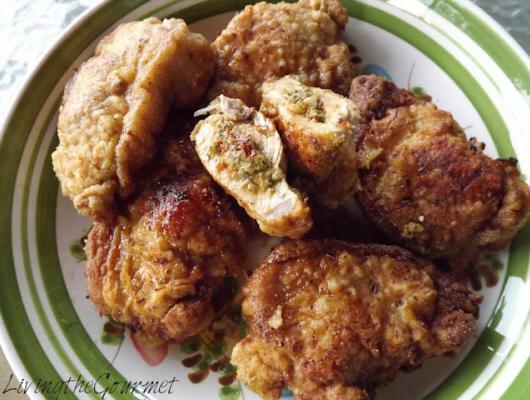 6 boneless pork chops – cut from a boneless pork loin about one inch thick. Make a pocket in the pork chop. Do not make the pocket on the side with the outer fat. For the stuffing, combine all of the ingredients in a food processor and give a few good chops. Do not over process the stuffing. Stuff the pork chop before coating. Combine the cornmeal and flour along with the dashes of seasonings. Dip the stuffed pork chops in the flour-cornmeal mixture first, then in the milk and back in the flour-cornmeal mixture. Heat a large frying pan with about a ½ inch of vegetable oil. Carefully, place the pork chops in the hot oil and let the coating get a beautiful golden color on each side. This takes about 3-4 minutes per side. Remove the pork chops and place in a baking dish. Bake the pork chops for about another 15- 20 minutes. This is a nice dinner for a special occasion and of course that may be any occasion you like.